If you're looking for a little sparkle to brighten your closet pulls or cabinetry, you'll love this. These cabinet knobs are made of solid K9 spherical crystal glass. 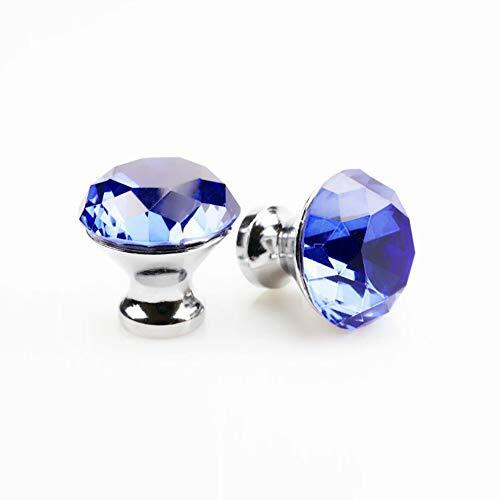 They literally shine like diamonds and feel smoothly in hands and look fantastic.They will add a look of luxury to the your dresser, closet, cupboard. You will love that they come with three different length screws so the knobs can be used on many different places without a separate trip to the store to find a length that works. Stunning & Elegant: Made of high quality K9 crystal glass (NOT acrylic plastic) and chrome silver base, this heavy duty crystal dresser drawer knobs are durable enough for long time use, just add some sparkle to your house. Screw Length: 22mm, 25mm, 30mm, so the knobs can be used on many different drawers without a separate trip to the store to find a length that works. Easy to install. Find the position where you want to install on the board and drill a hole , then pass through the screw from the back of board anf thread tight to the knob. Unlike other crystal knobs, these knobs are glued onto the whole base, so you won't see the metal base when installed, looks beautiful. The knobs were the finishing touch for simple dressers. If you have any questions about this product by SCTD, contact us by completing and submitting the form below. If you are looking for a specif part number, please include it with your message.